Come enjoy our sparkling pool & spa. We have it all! 156 FHU sites, 86 big rig pull thrus, friendly staff, dog run, bike trails, laundry, restrooms, BBQ area, rec room & FREE WIFI. Groups & pets welcome! Quiet, clean & safe. This is a nice park with very nice restrooms. Very expensive for a short gravel site. Sites are only 50 feet long and not level. Was told pull through and did not have to remove towed vehicle, but we are 44 feet plus towed. Obviously we had to drop the the towed. The Good Sam directions into the RV park are completely wrong as you cannot enter from Canyon Road. However, there was a sign on Canyon stating this. We paid $52.20 for one night with our Good Sam discount. Stayed here for 3 days in our motorhome, March, 2018. Pricey,even with Good Sam discount but a clean well-kept park. Sites fit a large rig, but have little extra space. Internet is advertised as available and offers multiple devices with streaming. This was important to us and I was assured it was excellent when I made the reservation. In fact, during our stay we had no usable internet. Brought it to their attention several times and their maintenance guy agreed there was a problem but they did nothing to resolve it. Very disappointing. Well maintained, gounds are clean, restrooms (4 in park) are clean and kept up. Staff are helpful and friendly. Two dog run areas. Outdoor pool/hot tube. We could not have had better camp hosts. We had a pet emergency on our way to Hoover Dam. It was a Sunday, and no local pet hospitals were open. They went above and beyond to help us, and they were so compassionate to my family in our time of need. I can never thank them enough. 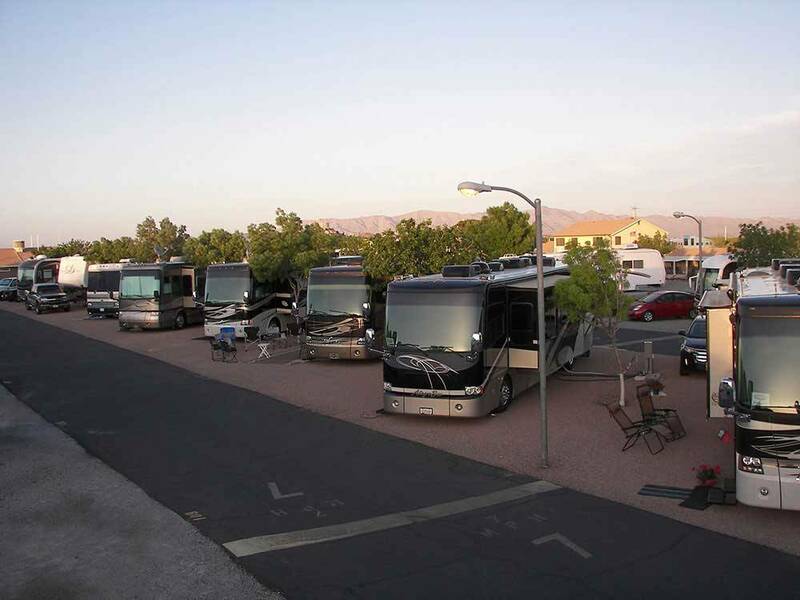 Very nice, flat and well-located RV Park. The owners are very helpful and check-in was quick and easy. Nice pull-thru sites for our Class A but the policy is that tow vehicles must be unhooked which is a little bit of a bother for a one night stay. WiFi connection was not good. We would definitely stay here again! 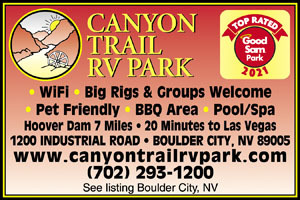 This was our second stay at Canyon Trail RV Park! It is a very nice park with level sites, paved roads and spotless facilities. Best of all we enjoyed the new pool and spa! We would highly recommend this park as a base station to enjoy Lake Mead, Boulder City and Las Vegas. There is also a great bike trail near the park. Very clean, easy to get in and out, easy to find. I was just over 50 feet and was able to leave my box trailer connected in a pull thru space. Pool was clean and cool compared to the 100 plus degree days. I will be going back again, very convenient to Henderson and the bike path. Nice level gravel pull through site. Very friendly accommodating staff (owners live on site). Great location with small pool. Enjoyed Historical Boulder City area and Hoover Dam being so close. Well maintained.